‘Machine Gun Preacher’ the film is based on the life of Sam Childers who is dubbed in real life as the ‘Machine Gun Preacher’. Sam was actually a pretty mean motor scooter in his younger days. He was known as a heavy drug user, alcoholic, belonged to a motorcycle gang, and possibly murdered a homeless man. He was a bad guy. You really don’t like him in the beginning. After doing a stint in prison, Childers is released and comes home to his family. He lives with his wife, young daughter and mother. He attends church with his family and finds God. He turns his life around and starts doing odd jobs in construction. He eventually makes enough progress and friends that he opens up his own construction business which is pretty successful. He comes in contact with a preacher from Africa who talks about the atrocities and genocide going on in Sudan. This strikes a chord with Sam and he decides to journey to Africa and see what’s going on and how he can help. Once there he sees families murdered, kids abducted, raped, and killed almost everyday. Over time, Sam builds sort of a ranch that is fenced off with housing, food, playgrounds, and a church for the thousands of kids and families he saves from the evil enemy. If it weren’t for Childers, tons of innocent kids would be dead or would be forced into slavery to work for the enemy. So Childers goes into the rough African terrain and literally kills the enemies to save the innocent children. This is almost a daily routine. That is the basic plot off the film, but it is so much more than just that. One thing that constantly comes up when people question Childers is how can he be a man of God and a “good christian” and still kill people. Childers answer is not only the correct one, but is simple and to the point. Childers says that he doesn’t condone anything he does and does not wish people to do what he does. He also says “If you’re child was abducted and I could get them back to you, would you care how I did it?” Those words ring true. Childers does exceptional work over in Africa, and this film ‘Machine Gun Preacher’ does show it. Gerard Butler of ‘300’ plays Sam Childers. From my viewing, I think Gerard did a great job. This I think was one of the more difficult roles for Gerard because of the subject matter and the intense emotional pressure that was involved in playing this type of role. But Gerard succeeded with it, but I imagine it took a toll on him. As for Michelle Monaghan who plays Lynn Childers (Sam’s wife), she is just phenomenal. She should get an oscar nomination for her work in ‘Machine Gun Preacher’. She really became Lynn in the film. It was brilliant. Gerard and Michelle seemed to have quite a bit of chemistry in the film. I wouldn’t be surprised to see them together in another film. They played off each other very well. ‘Machine Gun Preacher’ is a solid film. It’s a powerful, harsh, true life film that will make you think and spark up discussions in the days following your viewing. This movie needs to be seen. Marc Forster did an excellent job directing this brutal film. Forster’s resume includes ‘Monster’s Ball’, ‘Stranger Than Fiction’, and ‘Finding Neverland’. 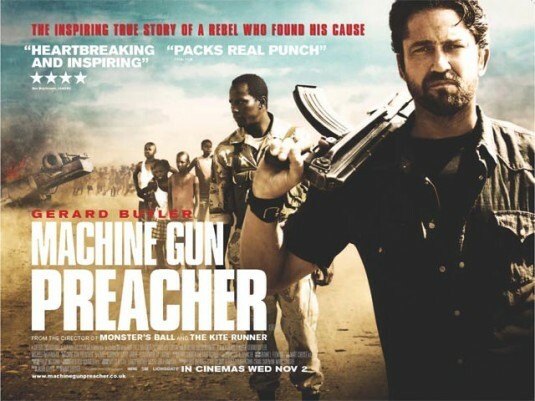 Forster did an outstanding job with ‘Machine Gun Preacher’. I am currently looking forward to see what he does with ‘World War Z’. See this movie. Like I said earlier, this is not a feel good film nor is it for the weak. Superb job. FedMex Reviews ‘Machine Gun Preacher’!!! CHECK OUT OUR INTERVIEW WITH SAM CHILDERS, THE REAL ‘MACHINE GUN PREACHER’!!! This entry was posted on Saturday, October 1st, 2011 at 4:33 pm	and is filed under Film. You can follow any responses to this entry through the RSS 2.0 feed. You can skip to the end and leave a response. Pinging is currently not allowed. « The New ‘Winnie The Pooh’ Movie Has Just Been Announced and Detailed For Blu-Ray & DVD!! !